How did Bin Che, the Chinese teacher featured in “WHERE WE STAND,” end up in Belpre, Ohio? 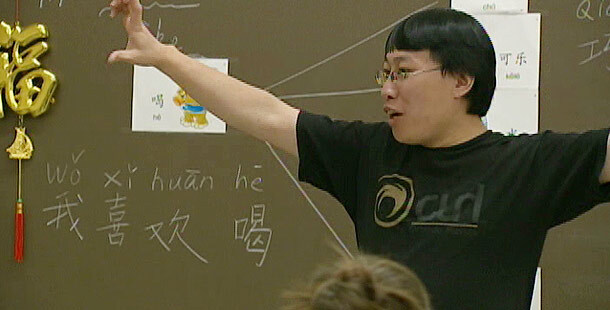 Bin was one of 21 teachers from China, Taiwan and Spain visiting Ohio in the 2007-2008 school year, the result of international agreements between the Ohio Department of Education and the Chinese ministry, the Hanban. Ohio is one of only four states that received a federal grant, called FLAP, for the development of a K-4 Chinese language curriculum. In Belpre, Chinese classes have inspired students like Roger Lemley, a recent High School Graduate, to continue language studies. Due to budget cuts, however, some districts – including Belpre – are being forced to drop Chinese. Finland: What’s the Secret to Its Success?